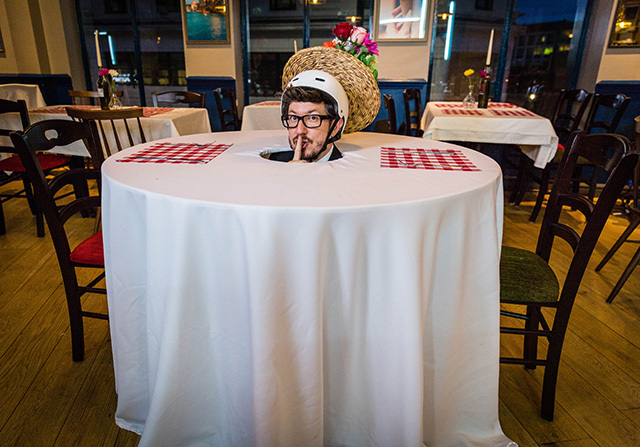 In a playful prank style reminiscent of legendary Saturday night family TV shows such as ‘Beadle’s About’, wherever you are, whatever you’re doing, BBC1’s Ready Or Not has a team of game show hosts are ready to surprise anyone – anywhere (in the UK)! 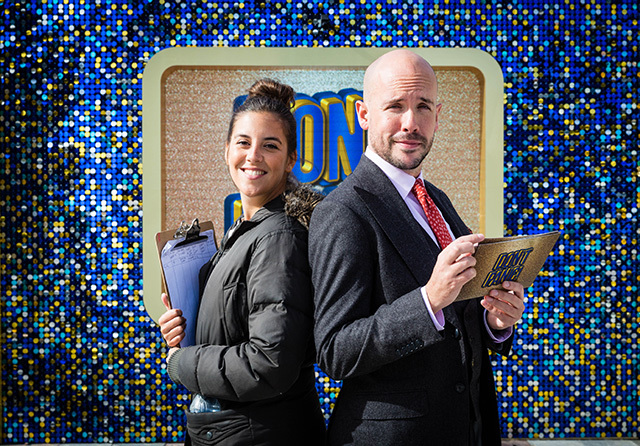 The show’s voiced by primetime fave Paddy McGuinness as he talks us through the antics of a multitude team of familiar-faced presenters – including Crumpet, the talking dog – who are ready to pounce on startled shoppers before hitting them with a series of questions in exchange for anything from £10 to £1000. I’m left pondering what the collective noun for a group of game show hosts should be – A glitz? A cache? A prize? Answers on a postcard, please. Sorry to disappoint but Crumpet the talking dog was having a ‘ruff’ week (come on…) so we couldn’t send him any lead-ing questions (I’ll stop)! Instead, Entertainment Focus were treated to a three-way (conversation) with comedian Tom Allen, 34, who’s been busy surprising people from behind with a glamorous set in the middle of busy shopping centres, the vivacious comedian and Funny Women winner (2009) London Hughes, 28, whose challenge involves springing riders at London’s Orbit slide screaming a list of answers before they hit the bottom, and top sketch comic Matthew Crosby, 38, who’s been busy popping up through tight holes – the middle of a table in a crowded restaurant or even masquerading as a bowl of bananas – in order to quiz unsuspecting members of the public. It sounds bonkers because it is – and that’s what Saturday Night TV should be about! First up, we spoke to So You Think You’re Funny winner (2005) Tom Allen who’s touring the UK making theatre crowds guffaw from Spring – Autumn – you can find all his tour dates at www.tomindeed.com – after you’ve continued reading this interview, of course. This is a very exciting new BBC show, Tom, and it seems that you’ve got the biggest wad (of cash to give away), is that correct? Tom, your segment of the show is called ‘Don’t Panic!’ but what makes you panic off screen? You aren’t quitting stand up now you’re a glamorous game show host, though, are you? So is it a bit like ‘Beadle’s About’ meets Fifteen to One? What were your biggest influences on TV growing up? Next, we spoke to Matthew Crosby, the beardy, bespectacled third of comedy sketch troupe, Pappy’s – if you haven’t heard of them or their podcast ‘Pappy’s Flatshare Slamdown’ then WHY NOT? Matt, is this your first appearance on BBC1 Saturday night primetime? How long were you having to hide before revealing yourself – were you worried you were going to get caught out? ‘Yes! I was sat under the restaurant table for a good twenty minutes. I had to stay stock still as if I moved the flowers would move and give the game away. I kept hoping the women wouldn’t kick me and realise. I had an ear piece in underneath my crash helmet with the producer ready to count in 3…2…1… but there were several false starts. I was about to leap out then one of the women suddenly got up to go to the loo! It’s about holding your nerve and it’s great to catch the live reaction because it’s the last thing they expect. Did you worry that someone could react in a violent way and lamp you one? I know you’re not exactly a guy of huge stature but you must’ve been really cramped? You seem to really enjoy being involved and making it fun for the audience. Who were your influences / favourite game show hosts to watch when you were growing up? Next we caught up with top writer and comedian London Hughes, 28, who’s got her sights on cracking the USA and has already been snapped up by an agent… #KeepLondoninLondon campaign, anyone?! London, the Orbit slide looks terrifying. Did you dare go on it? ‘No way, I refused to go on the slide! I’d abseiled down for charity in the past, really slowly, and it was the worst thing I’ve done in my life! It’s taller than the Statue of Liberty! All the contestants were really up for it, though. For £10 a question they were really going for it! Think one person one about £150 so it’s not bad for a couple of minutes’ work.’ You think of Saturday night game shows in fancy studios but I love that this is the game show that comes to you. Is this your first time on Saturday night prime time telly, are you excited? ‘It is my first time – you barely see black women in that slot and it’s wrong. There should be more women in entertainment and comedy, it’s so hard for women. Especially black women so I’m glad to be doing anything to help and try to be seen. I’m so into entertainment. At university I did TV studies and then I got sacked from a job at TGI Fridays, so I went to an open mic comedy show in Soho instead. The following week I was up there performing. I just did it because it was fun – I have to thank TGI Fridays for sacking me or I wouldn’t be here today! That’s an incredible rise to fame. So had you always dreamed of being in comedy or on TV? Watch the first episode of Ready or Not this Easter Saturday (31st March 2018) on BBC1 at 6pm.